The lightweight M12 FUEL Drill/Driver provides up to 10 times longer motor life, two times more power and 4X more runtime. The POWERSTATE motor outperforms all leading competitors with constant power output, yet runs cooler and quieter with no wearable components and the REDLINK Plus Intelligence system ensures optimized performance while protecting your tool from overload, overheating and over-discharge. This Milwaukee tool also comes with a REDLITHIUM 2.0 compact battery pack and 4.0 extended capacity battery pack, which deliver more work per charge and more work over pack life than the competitors, even in extreme conditions. The MILWAUKEE M18 1/2-Inch Compact Brushless Drill/Driver Kit is the best drill in class, delivering unmatched power while maintaining its compact size. The brushless motor was built to ensure optimal tool performance. 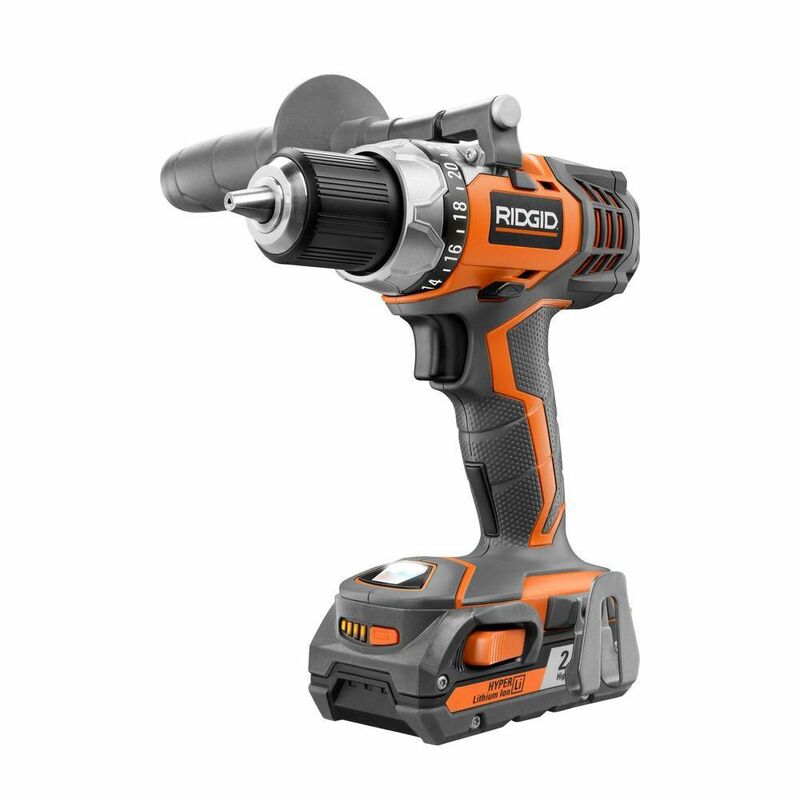 Built-in REDLINK power tool technology paired with REDLITHIUM batteries ensure these compact drills provide efficient power delivery resulting in less down time recharging batteries. The brushless drill's compact body is 6-1/2-Inch long and lightweight at 3.4 lb. with the battery attached. Its small, light build allows for excellent control, especially while working in overhead or tight spaces. The compact drill/driver delivers 500-Inch lbs. of torque and 0-500/0-1,800 RPM, able to tackle a wide range of drilling and fastening applications. The cordless compact drill has an all-metal gear case and 1/2 metal chuck. The compact brushless kit comes with the 1/2-Inch drill/driver, two M18 REDLITHIUM CP2.0 compact batteries, a M18/M12 Multi-Voltage Charger and Carrying Case. 1/2-inch 18V Cordless Lithium-Ion Drill Kit (1 Battery) The Ridgid 18V Cordless Lithium-Ion Drill Kit features a 4-pole open-frame motor that delivers 455 inch lbs. of torque for a powerful performance. This drill has a 24-position clutch and a two-speed transmission that helps match the power to the task at hand, and the 1/2-inch single sleeve ratcheting chuck provides a locking mechanism to securely hold bits in place during high-torque applications. Plus, the convenient grip light helps you illuminate dark spaces while you work. 1/2-inch 18V Cordless Lithium-Ion Drill Kit (1 Battery) is rated 4.5 out of 5 by 19. Rated 5 out of 5 by OutdoorBob from My 3rd Ridgid Power Tool! This Ridgid drill is like all other Ridgid products with the life time warranty. Plus the battery fits my Ridgid impact screwdriver. I ordered this drill on line and received it quickly! Friends, it is win-win with Home Depot and Ridgid! Rated 5 out of 5 by Anonymous from Wondeful cordless drill. Awesome product and great performance.It took me awhile to choose the right cordless drill.Then I picked this drill.I have to say,I couldn't be any happier after I used this amazing drill.My next tool will be the "Impact driver" from the same brand. Rated 5 out of 5 by Trident from The RIDGID 18V Compact Drill This drill is nothing short of awesome! I have used it for heavy woodworking and have had no problems with it whatsoever. I highly recommend purchasing a 4A/H battery for it if you use it a lot as the 2A/H battery tends to run a bit short at times. Otherwise, I would absolutely recommend this tool to anyone! Rated 5 out of 5 by jenalou from 18-volt drill kit I purchased the drill/driver for my husband. Loved the price plus it included a life time warranty. Works great, lots of power. Have not had it long enough to see how long the battery life is during use.